Women's Health Dulwich serves Sydenham region. Women's Health Dulwich, in West Dulwich, provides comprehensive support and reassurance in pregnancy and provides general gynaecology care with compassion and sensitivity. Our facilities include a modern and friendly clinic in the heart of West Dulwich, which provides a calm and relaxing environment, as well as state-of-the-art scanning equipment providing the latest in ultrasound technology including 3D and 4D ultrasound scans. We do provide whole range of pathology and genetics service at Women's Health Dulwich. We work with The Doctors Laboratory (TDL). TDL is a medically-led laboratory, established in 1987. It is the largest independent provider of clinical laboratory diagnostic services in the UK. TDL Genetics provide a comprehensive library of genetic tests, including the new Harmony Prenatal Test. We specialise in the diagnosis and the treatment of gynaecological conditions such as menstruel problems, miscarriages, fibroids, infertility, contraception and menopause. We perform gynaecology scans with extensive counseling. We also specialise in obstetrics care. Our aim is to enable prospective mothers to have a positive and reassuring pregnancy experience. We are committed to promoting an environment of high quality, patient centered, safe care throughout the pregnancy. We aim to provide you, and your partner, a reassuring environment to discuss your needs, enabling you to be more confident during this emotional and important time. We provide pregnancy care of a type that is tailored to the needs of each woman. 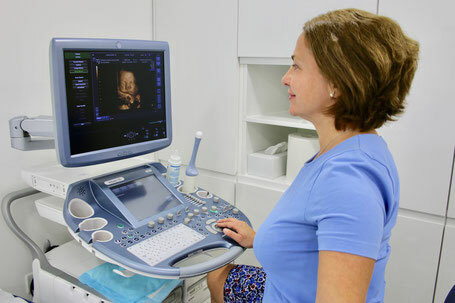 We perform pregnancy scans by the fetal medicine consultant with extensive counselling. We provide up to date services such as noninvasive prenatal testing (Harmony Test) for the diagnosis of Down’s Syndrome. Having completed an MSc degree at UCL with distinction in Prenatal Genetics and Fetal Medicine. Miss Berrin Tezcan, consultant obstetrician and gynaecologist, will provide you a comprehensive counselling about the chromosomal abnormalities and genetic syndromes and will interpret the results of your blood test. We provide our expert opinion and advice where necessary for our patients. There is no need for a referral letter from a GP or the NHS however if you wish us to contact your GP about your gynaecological condition and issues related to your pregnancy and scans, we can provide a comprehensive letter including your investigation results to your GP in order to improve the continuity of your care. We also provide second opinions often for clients in the NHS. We fulfill the requirements of all regulatory bodies.